Was it just now, when I told you you were charming and smart and a wonderful human being who has somehow found this hideaway blog of mine? Recently I watched this video about the power of accepting compliments. I am a complete sucker for Making Life Meaningful clips. In the video, these social science-y folks do an experiment where couples split up and the one with lower self-esteem gets complimented–genuine compliments, mind you–by their partner. The idea behind this experiment is that accepting genuine compliments is a) hard for people who tend to have lower self-esteem, and b) great for boosting self-confidence, since the act of acceptance allows us to reflect on ourselves positively. It’s not Compliment Fishing. I’d rather call it Anti-Compliment Defense Ballistics. I’m not (yet) great at accepting praise I don’t think I’ve earned, which is 95% of the time, and I’m pretty sure I cultivated this defense system because I grew up hearing about how So-And-So had gotten the title of Valedictorian while I had received an A- in Art, Lord have mercy on my subpar soul. Don’t even get me started on the number of guys who were “paying compliments” wayyy before I had any idea what was going on, just because it never registered that anyone would ever want to do such a thing. But before you start thinking I have a complete and concerning inferiority complex, I certainly am getting better at accepting compliments now that I know what to look for. The most frequent one I receive is still mildly (but really only mildly) embarassing: it’s about how much I smile. Most of the time when I hear this now, I’ll just grin even wider, maybe shuffle my shoes, and not say anything at all. Inside I feel pretty self-conscious, but really, it’s high time I learned to take the compliment, not overthink, and just roll with it. Yeah, I smile. And yeah, I’ll take that compliment! That’s why I was a good girl when it came to accepting compliments about today’s recipe. This weekend, I made Lemon Curd Coffee Crumble Cake (recipe coming next Sunday! 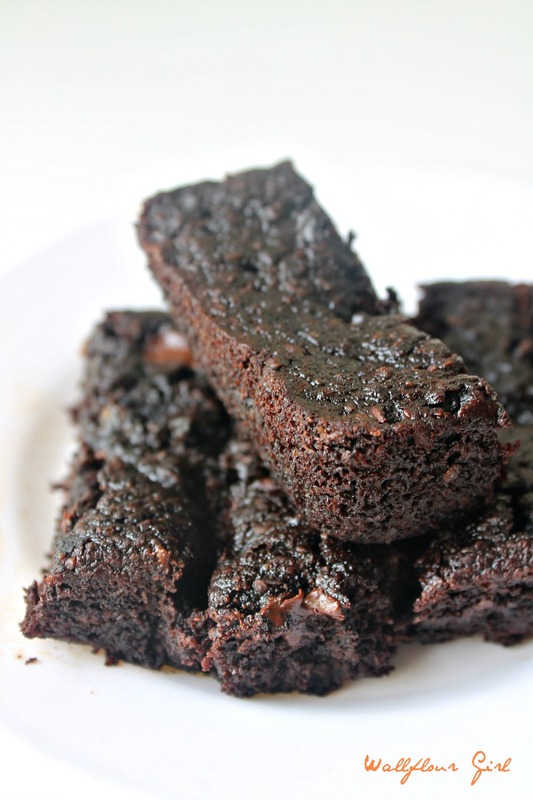 ), some of the Gochujang Peanut Pasta you all loved, and these Healthy Sticky Brownies I adapted from the inestimable Izy over at Top with Cinnamon, whose blog I consider in my Top 10 Favorites. If for some incredible reason (say, alien abduction) you haven’t visited her blog before, you need to. This girl pulls out all the stops with her photography and stunning, inventive recipes. Because deep down inside, I know that they’re right. And it’s not such a bad thing sometimes to let others make you feel good about yourself. This is why I love baking and blogging so much–talk about affirmation community central! And of course, the chocolate always helps. 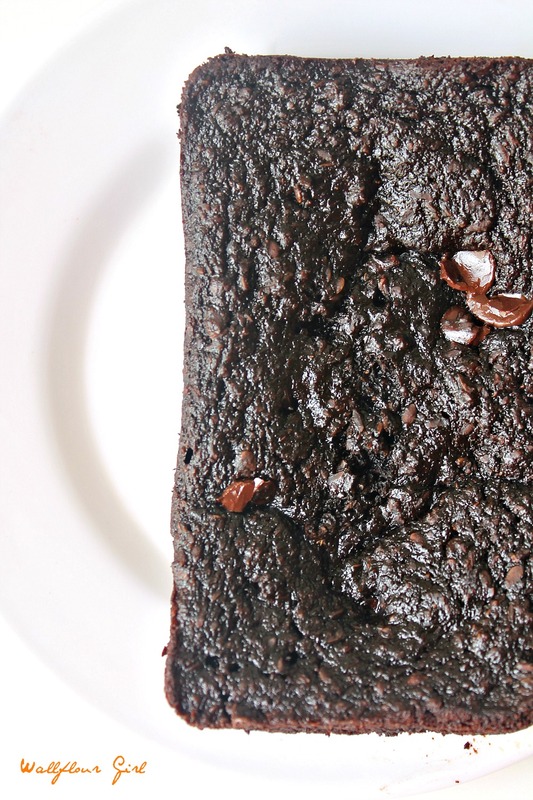 Don’t skip out on this easy peasy, oh-so healthy but not-too-sweet chocolatey recipe and all the compliments it will bring your way! So…what compliment can I pay you today? Leave a comment, I’d be so happy to meet your charming lovely self! Preheat oven to 350 degrees F. Lightly grease two mini-3x5 loaf pans, or one larger 5x7 loaf pan, and set aside. In a large mixing bowl, mix together honey, egg, vanilla, applesauce, and cookie/nut butter until smooth. Add flax, cocoa powder, baking soda, and salt. Stir in until just incorporated into wet ingredients. Fold in chocolate chips. Divide batter between two mini pans or pour directly into larger loaf pan. Bake in preheated oven for 15 minutes (mini pans) or 20-25 minutes (loaf pan). Cool completely before cutting into bars/squares, and enjoy! A great smile makes everyone feel better — one of the best assets someone can have. Although these fudgy chocolate things are probably a close second. 😉 Thanks for these. Well, you’re certainly one to make others smile, John! It’s always such a pleasure having you around–a very kind one-of-a-kind! Thanks so much for always having a nice word to share. Healthy brownies? Now that’s smile worthy! I might need to try this delightful recipe with my resident chocolate lover, he would adore each and every healthy slice! You’re so lucky to have another resident chocolate-lover in the house! I’m the only one, so often chocolate-lover translates into chocolate eater 🙂 it’s always awesome to have you here, Deb, definitely smile-worthy! It’s such a pleasure to have such a talented gal around. Happy Tuesday! This is exactly what I needed to satisfy my chocolate craving! Trying this STAT! YAY Meriem–and thank you for your totally sweet comment! I hope you have a day as wonderfully lovely and kind as yourself. Let me know how you like it! I hear you on the compliment acceptance issues too. I always feel a little thrown off when someone pays me a compliment, especially about physical attributes. I usually jusy stay quiet though or offer a polite ‘thank you’ and then try to change the subject. Arguing just seems to drag out the awkwardness of the moment. I like to think I’m getting better with them. Anyway I’m trying and that’s all anyone can ask of you, right? Thanks for another delightful story and recipe combo. Oh, you’d love them, Tifa! It’s so great having you around–you always leave the most thoughtful comments, and I appreciate your sweetness in that. I hope that’s a compliment you can (and should) take right off the bat! And you’re right–I think lately I’ve stopped protesting because then it does seem awkward and like I might be fishing, which isn’t meant to be the case. I guess we just all have to try our best! Yes! Was that the Dove commercial? I really enjoyed that one–it raised so many great points about how hard we can be on ourselves. Plus, I notice that grad students tend to go through even more of this than many other folks–I guess the rigor of the field can often lead us to wonder if we’ll ever contribute even a speck of meaningful material! I’d gladly send a slice of this cake to you, Zainab–goodness knows you deserve it. You’re so wonderfully kind and such an intelligent gal, it’s an honor just knowing ya!~ Happy Tuesday, girl! I am TERRIBLE at accepting comments also!! Sigh. Something to work on. These brownies are crazy gorgeous. They look so insanely fudgy in the best way! I was just telling Zainab that grad students always seem to push for something better–I guess that’s why we do what we do! Still, you must be an incredibly intelligent lady and it’s great to meet you. Thank you! I accept all sorts of compliments from my boyfriend 😀 But not my friends, mostly because I feel like they don’t see all the bad stuff. I mean, I can’t in good conscience accept a compliment like “oh you make the best bread” when obviously they just don’t see the batches the die a horrible death in the oven!! And also because none of them make bread, so their standard for homemade bread is probably pretty low… But thanks for telling me I’m charming 😉 I’m quite awkward in real life, I assure you. Daww, I know what you mean, Shelley! I guess that’s part of it: I squirm when people tell me something I must be a great baker and I know that I had just scrapped bits together from out of a burnt batch of brownies or something. But dude, I think we’d get on just fine 😀 sounds like we’d have loads to discuss, anyway. Isn’t it crazy how much we would talk about on the internet but not in person with our friends? 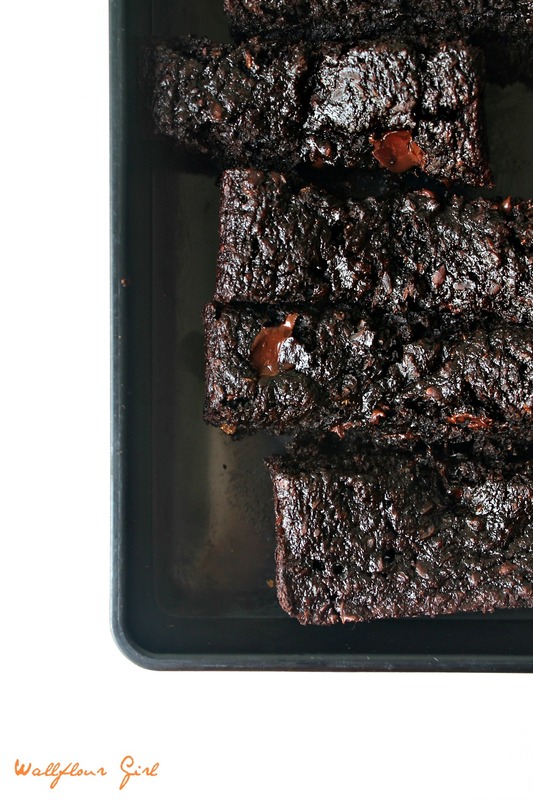 Well, I think you’re a magnificent, talented blogger either way and you deserve a batch of these brownies. If only I could get them to your doorstep! 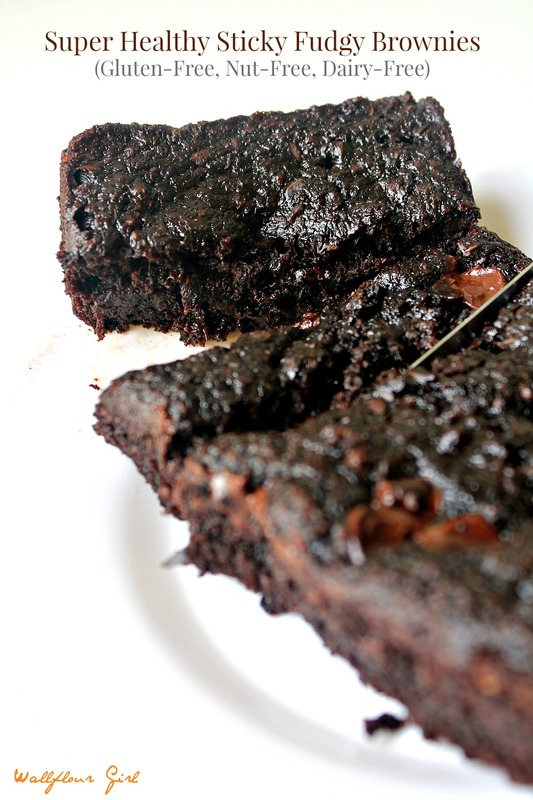 Oh, man, fudgy brownies with Biscoff??? Yes, please!! Give yourself a few decades and you’ll take every compliment you can get…LOL…that’s my philosophy anyway! You ARE a great baker, a great friend and have a great smile! Heh, just a smidge of Biscoff, Liz! (But I know, right? 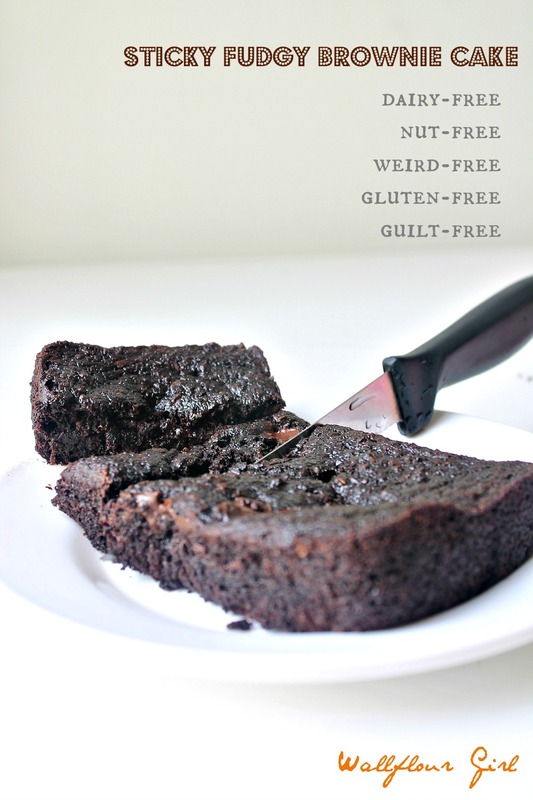 Way to make it vegan…and less healthy but incredibly delish!). And I love your advice–your confidence totally shines through every time we chat. So I”ll just say, THANK YOU! These look like the perfect brownies and I can’t imagine how you came up with this recipe, but I am so glad you did! I can’t wait to try them! It was a total and fortunate stroke of luck, Nora. I’m so glad you like them–let me know how they turn out so we can put our heads together and drool! Have an awesome weekend, Nora! I have hard time accepting compliments too and tend to wonder if there’s a hidden agenda or meaning behind that compliment. I think it’s awesome that you always smile 🙂 Definitely makes me rather hang out with you than a Mr. Grumps any day 🙂 Plus you always know how to make creative swoon-worthy treats! Like this brownie cake, it looks alll kinds of amazing girl!